It aims to create an experience focused less on quick encounters and more on long-term ties. Facebook se lanza al mercado de las citas en líneaA partir de hoy la nueva 'app' está disponible solo en Colombia y se llama 'Facebook Dating'. 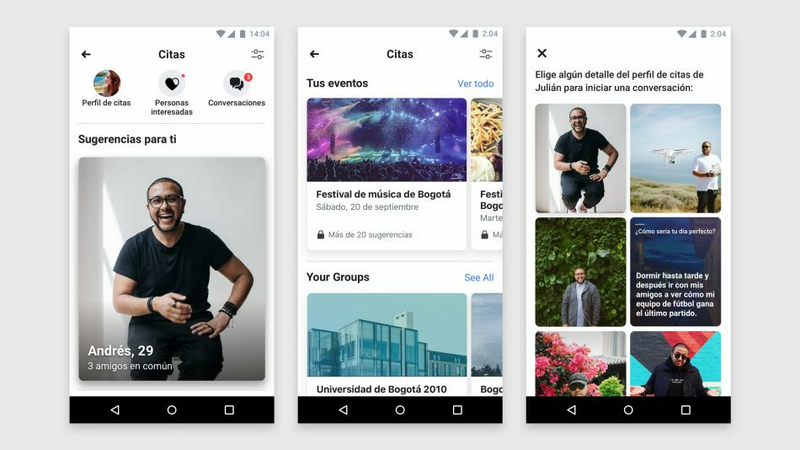 20 de septiembre 2018 , 08:11 a.m.
Due to its widespread use of social media and liberal attitude to online dating sites, Colombia this thursday becomes the first country in the world to receive Facebook's newest feature, 'Facebook Dating'. Facebook has forged its role in society as a company which encourages users to create and sustain meaningful relationships. The natural next step, of course, is to introduce a new competitor in the online dating arena. Unlike other familiar dating sites, where people ‘swipe’ depending on people’s appearances, Facebook Dating aims to create a personal experience focused less on ‘fast hookups’ and more on encouraging long-term bonds. The feature, available only for persons above the age of 18, will be a part of the current Facebook app, and will work on an opt-in basis, so you can decide whether or not you want to start using the feature to find a partner. How is it more personal than other dating services? With Facebook Dating, the concept of ‘matching’ no longer exists. To message someone you´re interested in, you no longer need them to have shown interest. Hence people are given the chance to start a conversation and show off their personality, without such emphasis being placed on looks. A completely separate chatting space (to 'Messenger') is used, where the transfer of photos, videos, payments and links is prohibited at first, to help people avoid inappropriate spam and allow them to focus on creating genuine connections. It also introduces the concept of the ‘anchor,’ where people have to start a conversation relating to a photo or part of their profile, encouraging people to put more thought into their opening messages, instead of sending out the same generic message to lots of users. ¿Las redes sociales han complicado su relación de pareja? How is it more private? It focuses on dating people that are not your friends, so while you might be able to date someone with mutual friends (seeing this helps to establish trust between potential partners), your family and friends will not be able to see that you have started using the service. For those looking to find someone completely outside their network, they can also add an extra layer of security where you are unable to chat with those with mutual friends. In addition, a new simplified profile is created within Facebook Dating, which takes only your first name and age from your main Facebook profile. Everything else you add yourself, so you can control which photos and content are shown to potential partners. Perhaps the most innovative feature of Facebook Dating, is the way it connects people through events. Facebook shows you the other users of the service interested in similar events, encouraging people with similar interests to begin talking. It maintains your privacy again by only showing those looking to date and those that fit your gender and orientation preferences. It even links people through past events, to give people that electrifying feeling of discovering a misconnection. Ultimately, Facebook has found the perfect balance with its new feature. 'Facebook Dating' is simple, personal and private.